What's the Formula for the Product of a Sum and a Difference? 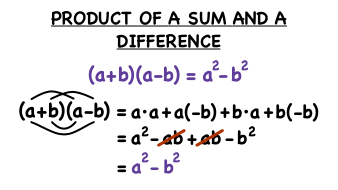 Multiplying monomials like (a + b) and (a - b) is really important when it comes to factoring, so if you want to get good at factoring, you're going to have to understand how to multiply a sum like (a + b) with a difference like (a - b)! How Do You Use the Formula for the Product of a Sum and a Difference? Finding the product of two binomials with the same terms and opposite signs? You're finding the product of a sum and a difference! Use the formula for the product of a sum and a difference to quickly find the answer! This tutorial shows you how.